One of my friend Saket, sent me this article and I thought to share this page which inspired & motivated me. 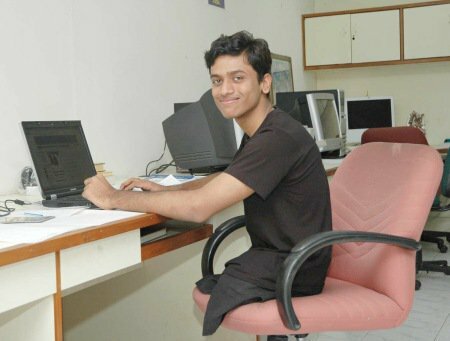 Meet Naga Naresh Karutura ; he just passed out of IIT Madras in Computer Science and has joined Google in Bangalore. You may ask, what’s so special about this 21-year-old when there are hundreds of students passing from various IITs and joining big companies like Google? His parents are illiterate. He has no legs and moves around in his powered wheel chair. He is ever smiling , full of spirit & optimistic. Naresh feels ‘he is lucky’. When I myself met with an accident on 02-Jan-2011, I never thought I could write/type. Big thanks to my friends Arvind Kumar Vyas and Rakesh Kadarla who ran up/down at Manipal Hospital, Bangalore for my quick recovery. Today I’m touched by Naga Naresh Karutura ; if he can life his life without legs then why can’t I live with injured palms and foot.